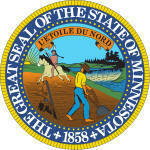 The blue State Flag of Minnesota depicts the state seal which features a farmer cultivating the land watched by a Native American Indian on horseback. The outer circle of the seal depicts the name of the state and a series of symbolic golden stars. The flag serves as a symbol of honor, heritage and regional pride and is displayed at state buildings. There is a strict Order of Precedence for flags. State Flags are displayed in order as they entered the Union. Car Flags are often displayed to represent of an individual's allegiance to their state. Minnesota State car flags are used by their owners as mobile emblems of their home. Car flags are usually made from strong materials and are attached to a car via a pole and clip window attachment. What is the design of the Minnesota state flag? What does the the stars symbolize? 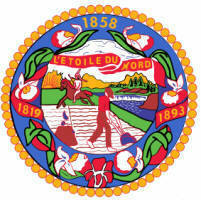 The image of the seal is surrounded by a wreath of pink and white lady’s slipper, the state flower. What are the colors of the flag and what do the colors mean, or symbolize, in heraldry? Who designed the Minnesota State Flag? What is the history of the Minnesota State Flag? In 1893, a contest was held to create a design to be displayed at Chicago World's Fair. Amelia Hyde Center of Minneapolis submitted the winning entry which featured a white field with the state seal and a blue color on the reverse. Pauline Fjelde, a textile artist, and her sister, Thomane, were contracted to produce the actual prototype flag. 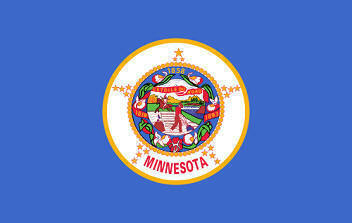 The Minnesota flag is kept and used as required by the code specified in the constitution of the state.